Before I go on, I have to mention that not everyone agrees that this PlayStation puzzler, developed by Fupac and published by Datam Polystar in 1996, should be called Loopop Cube: Lup ★ Salad. Some believe it should be called Loopop Cube: Loop ★ Salad, for instance, while others support Rupupu Cube: Lup ★ Salad. I won't chime in with my opinion on the matter because: 1) as I've said a million times before, I don't know a lick of Japanese, and 2) I don't much care what this game is called as long as I can play it. Which, of course, I can now that I own a copy of it. Why am I so hot to trot to play Loopop Cube: Lup ★ Salad? For starters, it's an adorable puzzler with a unique gameplay twist. The titular Salad is tasked with clearing each single-screen stage of its brightly colored blocks. To do so, she (with the assistance of the player, naturally) pushes them around until she can match three or more of the same color. As a result, I guess you could call it a platformer-puzzler hybrid, although it doesn't feel like any other such game I've ever played. 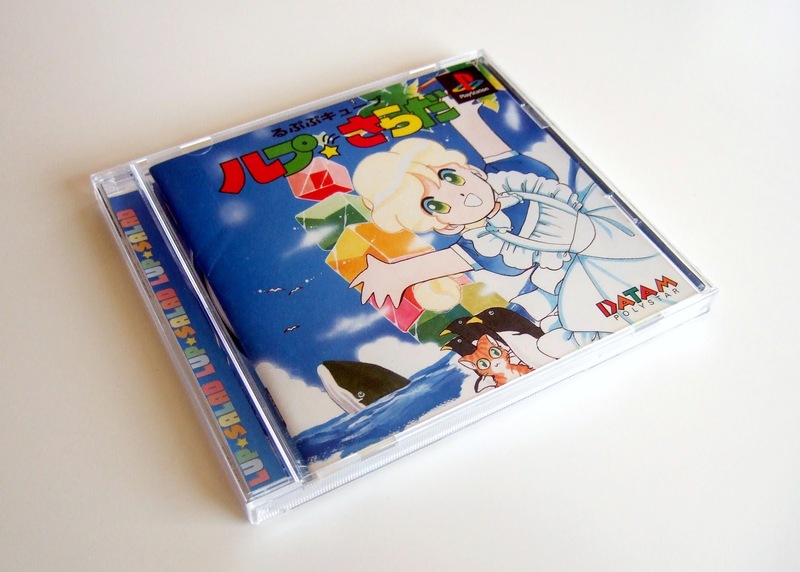 I should note, by the way, that I was completely ignorant of Loopop Cube: Lup ★ Salad (or whatever you choose to call it) until I came across this now-defunct NeoGAF thread. I also should note that the game was ported to the DS in 2008 and the PSP in 2010. 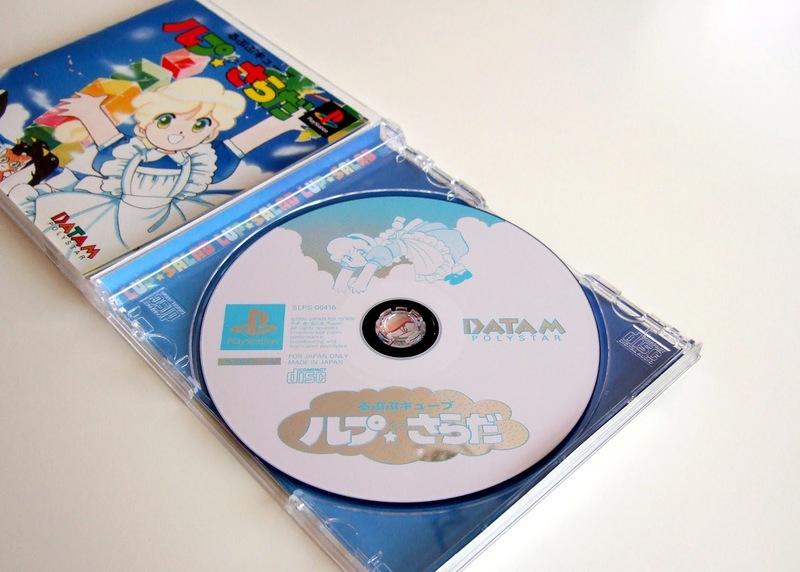 Both versions feature modes that aren't found in the PlayStation original and also seem to be more widely available than the first release. Since so little information is available on line about this precious puzzler, I'll do my best to get a review of it published soon. In the meantime, check out some of the links I included in the text above and enjoy the photos I've shared, too. I get a kick out of game boxes like this that don't even put screens on the back. There are a lot of Japanese games that seem to emphasize "intrigue" over "information" (ie, the back of Radiant Silvergun) but to not even show any screens is a pretty bold thing. Are they hiding something? What is their mindset? Hey there, Michael! I never thought about the fact that the back of this game's box/case/packaging doesn't show any screens. Huh! I definitely wouldn't say the developers/publishers were trying to hide something in the case of this game, as it's completely adorable. Maybe they just wanted to do something different? On a related note: I'm curious as to what the list along the left side of the screen is about. Is it a list of the game's music tracks? A list of the people who worked on the game? Regardless, why is it being highlighted in such a fashion? I agree, the game does look pretty nice! I have a feeling that you're right and that the devs/pubs of this one were trying to lure people in with the 'story element' of which you spoke. That's just a guess, of course, but I wouldn't be surprised if it were true. Regardless, I can't imagine this was a high-profile release back in the day, so I doubt lots of gamers would have been fully aware of what they were getting into when they picked up this game. I've been interested in this game since I read the same GAF thread, so I'm glad that it was (astonishingly!) added as a PS1 Classic on PSN so I can check it out. I was going to make a salad tossing joke until I realized it was the name of a little girl. But yeah I'll be putting this in my queue of games to dig up. I wonder if, as a low-profile game, the publisher was more willing to make a kind of weird box like that, or if it's just more of a mid-90s Japanese style thing. I don't mean to go on and on about this, I'm just.. strangely curious! As for going on and on about this game: no worries! I'm curious about it, too. And, yes, like you said, it could just be a mid-90s Japanese thing. Wish we knew for sure, though! Wow, that is such a lovely case! I first got to play Lup Salad thanks to the release on PSN (had never heard of it before). It definitely deserves more attention so hopefully this post will get more people playing! I just wish I could understand the story segments which happen every once in a while... like I don't get the significance of penguins in the game, but oh well, lol. You and I were turned on to this game by the same GAF thread, lunch. How cool is that? 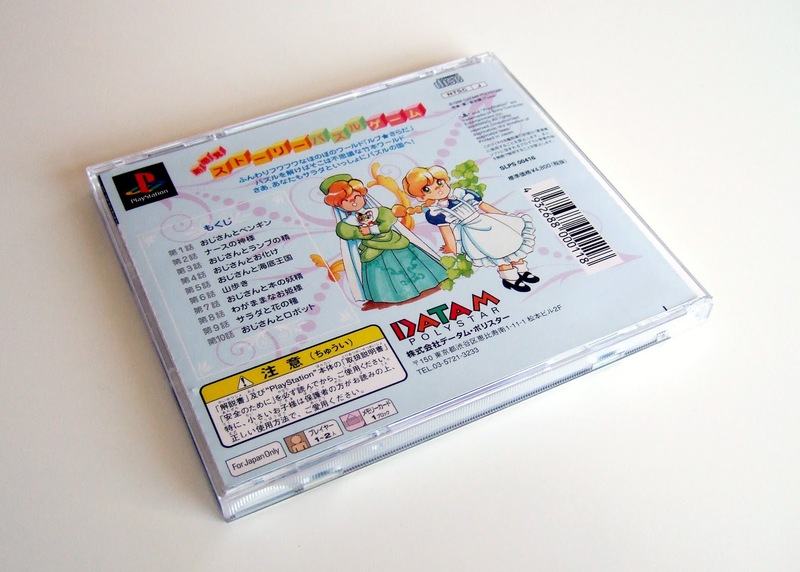 I didn't know this was available as a PS1 classic, by the way. On the US shop, or only the Japanese one? I believe it's in the Japanese Imports section, so it's up on the US Store, but the game is completely untranslated. Oh, yeah, I didn't think it would be translated. Still, nice to know it's now easily available for people in North America! how weird, i finally got my own copy of this one a few days ago. check inside your manual and see if you got the stickers! Oh, yes, I definitely got the stickers, sharc :) I'll show them off to others in a few weeks when I dedicate a 'Manual Stimulation' post to this game's adorable manual. How funny that you recently picked up a copy of this game, too, by the way. Had you been wanting it for a while? And have you played it yet? stickers were icing on the cake. Oh, I didn't think you were bragging, so don't worry about that. And, yes, the stickers are great--as is the manual and the rest of this game's packaging, if you ask me. I can't remember if mine came with a spine card or not. I think not, but such things don't really matter to me. (Which is kind of funny, as I definitely prefer to buy CIB games whenever possible).